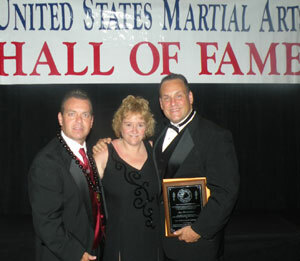 Joe Fiorentino, a Cook County Deputy Sheriff and a proud Italian American, was inducted on August 1, 2009, into the United States Martial Arts Hall of Fame. Joe started training in the martial arts in 1977 taking judo. Over the years, he has trained in many styles accumulating a lifetime of awards. including a Championship Belt at the Naga Midwest Grappling Championships and most recently became the #1 Ranked Director Division Grappler in the Nation. As a Cook County Deputy Sheriff and Shidokan Black Belt Joe has given back to the community. Volunteering to teach self defense to fellow Officers and to the Cupscouts with Sensei Duane Sharp. In recognition of his volunteerism, in June 2009, Joe was awarded the President`s Volunteer Service Award from President Obama. As a Officer he was Awarded the NRLO Outstanding Officer Award and the Knights of Justice Award. Joe is proud of his Italian Heritage. His roots go back to Sicily and La Puglia Regions. His family settled in the Italian Neighborhood near Grand Avenue and Halstead in Chicago, Illinois, where some of his relatives still call it home. He is a member of the Italian American Police Association , NIAF and OSIA.